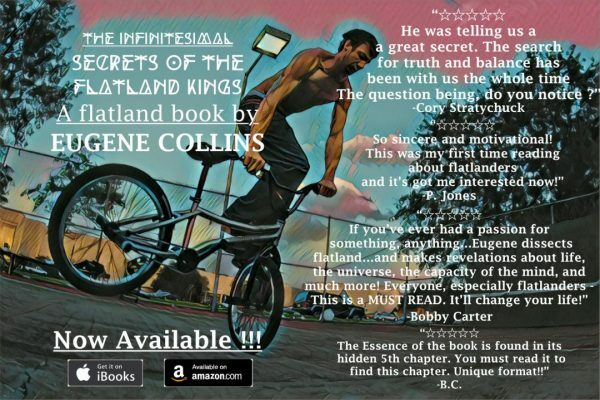 Flatmattersonline - Review: The Infinitesimal Secrets of The Flatland Kings Book. 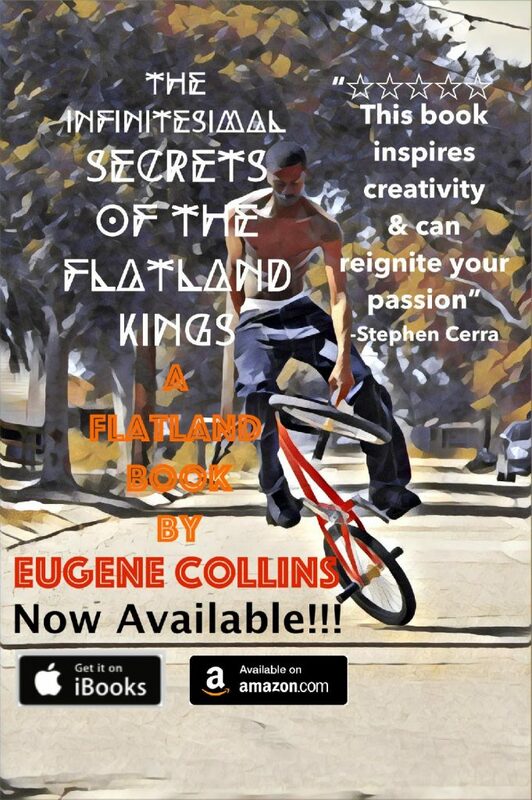 When the news broke there was a flatland book coming out, I instantly knew it was something I must read. After getting the file, the first thing my eyes hit was the artwork not only in just the pictures but also within the words. It really encapsulates this book and you will soon find out why. How precisely true this is. The best things in life are this way. It was never the bike that made you good, it was always you and your soul all along. And we haven’t even begun yet. Level Zero is where it begins. He talks about what riding really means to him and us on a spiritual level. I believe that it’s something many of us can’t see the way he does, but he is extremely able to for those of us that can’t to finally see just how magical the sport really is. There were so many appealing thoughts and ideas that my brain started flooding. It was written in such a way that my thoughts started dancing in tune with the words on the page. It is not written like a classical book, although it does very well to explain flatland to those who do not know. It was however written with us particularly in mind. History has taught us this exact lesson time and time again but here’s the living lesson in all of us who chose this life. He was telling us a great secret. The search for truth and balance has been with us the whole time. The question being, do you notice? Truth and balance were ultimately the greatest things flatland ever taught me. It carried me out of a place where I’d never know the truth and into a place where it would be utterly inescapable and for years to come. Also worth mentioning was the mind state he spoke of. Extremely accurate account of time going out the window when you ride. All athletes see this when things go slow motion in mid process of whatever they do that gets them there. By pushing the limits of what’s possible you quickly realize anything is possible. We can become creators when we break open the limits of reality and see for ourselves that the concept of time is manmade and that it literally disappears when you are truly immersed in what you are doing. This is the relativity Albert Einstein referred to when comparing putting a hand on a hot burner or sitting next to a pretty lady. 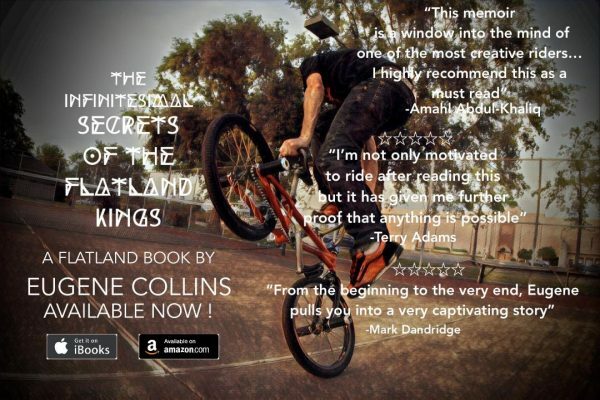 Now this book isn’t just about the spirituality behind doing tricks on a 20” BMX bike. He also gives us a real honest look into the artwork that was also a dear passenger on his journey. Learning the story behind this artwork was somewhat painful. You never know what people actually went through to finally share it with you. The honesty here was appreciated and it gave me new insight on similar things in my own life. And with that glimpse into his artwork we were also given the story of all riders originating from Louisiana in that time. I also know in that time Terry Adams sure put Louisiana on the map when he came onto the scene so it was really nice to hear about his way there and who his inspiration was in the beginning. Eugene’s story is like all of ours. Everyone has a unique set of experiences but the commonalities are very much on the same level because it’s just that way. Read this book and let it hit you hard. The hidden chapter is the most important part of the book because of how you must attain it. Like all good things in life you must search. Overall this book was an excellent read and gets better each time you read it and the more you think about it, the more you want to read it (again).